Permaculture, as described on wikipedia, is an approach to designing human settlements and agricultural systems that mimic the relationships found in natural ecologies. This is the link to permaculture in wikipedia. This photo was taken about a fortnight ago. You can see the native wisteria coming into flower with pinkish-white flowers. The pond is settling into place nicely and the vegetation is growing around it, slowly though in the cool weather. Cauliflowers and spinach in the garden bed to the right and some green buckets from when I was transferring some of the greywater. In the background are the gums and bottlebrush and some of the fruit trees in half wine barrels. So, I have the general outline of the garden already begun. Now I am simply observing what works best where. What the sun is doing during the course of a day and during the various months. Some elements of the garden are not in the most ideal position, but are serving a purpose, so for the moment I am working with it. 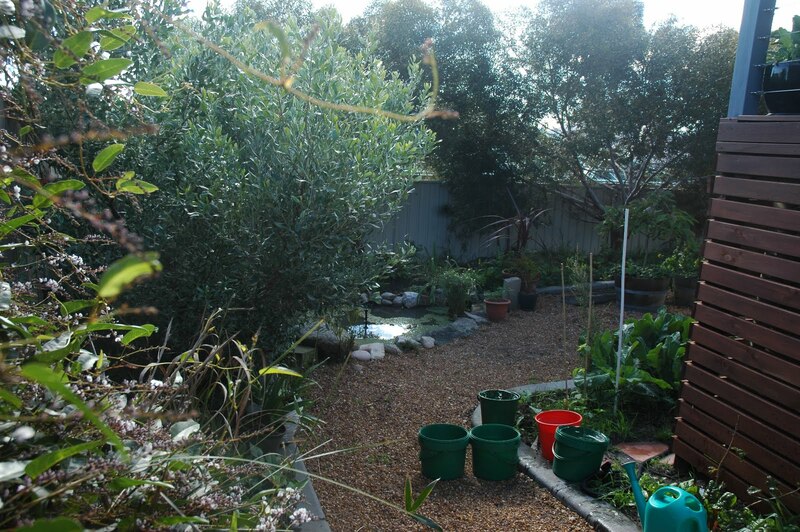 For example, the row of 3-4 metre high myrtles along the back fence block out quite a bit of winter sun and shade half of the garden. But the upside is that they nicely shade the garden in the height of summer and they provide decent privacy from the house that has been built on the back block. They are also a major attraction to many of the bird species that frequent the garden such as the honeyeaters, silvereyes and rosellas. The block in general slopes towards north-nor-west. This is good in that there are other areas of the garden that capture quite a bit of sun during the day and have good drainage. Another reason why the rainbow rubble has been a good choice in replacement of the lawn as it has allowed for water to be transferred down the block from the vege gardens to the back garden which is the damper end of the block. From here it can continue to the neighbours back garden where it meets a terraced limestone wall and then is diverted down to continue along the greater hillside that all the houses are built upon. At the moment we have limited animals in the system. Native birds, two guinea pigs, five goldfish and hopefully also five or six yabbies in the bottom of the pond, some pond snails, a couple of hundred free-range earthworms and compost worms and a handful of minnows in a water container to keep mosquito larvae down in that particular area of the garden. Perhaps in time, given an increasing food supply for the g-pigs we will look at adopting a few more g-pigs and creating a chicken coop for a couple of bantams or layers. I can already see that come spring when the garden is picking up pace there will be a greater call for recycling much of the green material that is going to be around. Another element which has been very handy so far with our waste recycling has been our Aerobin. This hides in a handy spot under the house deck and is fed nearly daily with kitchen scraps, vegetable matter from the garden and sometimes the paper lining used in the g-pigs hutch. It got off to a rough start because I had put too much dry sticks and hard cardboard in the bottom, but after a sort out, it is working beautifully and has been of great assistance with taking waste in a more convenient manner until we get the garden into a flowing system and can utilise the other compost heap a bit better (which is currently where the future chook pen will go) and have room to bury some scraps directly in to the garden as well. At the moment it is mostly planted out with crops and green manure areas.